The following post on improving patient engagement in healthcare was submitted by Audrey Thorne. Innovative technologies and groundbreaking discoveries have changed the face of the healthcare industry. Due to them, ailments that were previously life threatening are now easily cured, surgical procedures have become less invasive and self-help devices have given birth to an empowered and more health conscious society. Moreover, in addition to enhancing the quality of patient-care, these technological advancements have also revolutionized physician-patient relationship – making it much more collaborative in nature. 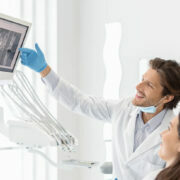 Nowadays, we see doctors being able to keep a constant eye on their patients via tracking devices, patients being able to connect instantly to their physicians via video calling apps and both equally partaking in the healthcare process. The government is struggling to make optimum use of a limited amount of resources in order to provide healthcare services to a growing population. This disproportionate ratio of medical service providers to patients causes patients to endure long waiting times in healthcare settings and also inhibits physicians from spending sufficient time with patients to provide in depth consultation and monitoring. Even in the coming decade, the Association of American Medical Colleges has projected a shortfall of physicians ranging from 61,700 to 94,700 causing healthcare providers to search for innovative ways to increase the reach as well as the scope of healthcare services. It is due to these escalated efforts that we now have a number of devices and applications that facilitate round the clock correspondence between doctors and patients and also enable patients to become actively involved in the healthcare process. These technologies include informative sources that give patients a greater understanding of the intricacies of their condition and possible courses of treatment and allow them to decide on a care plan in collaboration with their physician. This in turn increases their ownership of their care plan as well as their determination to see it through. Moreover, we also now have an array of reliable self assessment tools such as Brain Test to help detect the presence of ailments, in this case cognitive disorders, that not only serve to satisfy patient curiosity but also encourage them to seek timely medical assistance. In addition to these, self-help apps like Fitbit allow patients to constantly monitor and improve their health. This is crucial since healthcare by nature is a two-way process where it is absolutely essential for both parties to play their part for a treatment to be effective. Therefore, these technologies, albeit simple, have proven to be game-changers as they have allowed patients to play their part in ensuring their health and well-being. A decade ago, hospitals used to run on paper-based records with the staff having to go through stacks of files in order to learn about a patient’s medical history. Likewise, patients had to personally maintain their medical records and repeat their history to every doctor that they visited. Both these factors caused healthcare services to be disease-specific whereby physicians would attempt to diagnose an ailment based on the information available and recommend treatments to resolve the underlying issue. However, technology has shifted healthcare from being disease-specific to individual-specific as physicians are now able to use electronic medical records to provide tailored treatments to patients. This has catapulted the quality of medi-care by allowing accurate diagnosis and treatment and has also deepened the relationship between doctors and patients. Doctors are now able to remain in touch with their patients throughout and even after the course of the treatment via online forums and applications such as Epocrates that facilitate doctor-patient dialogue. Moreover, such apps also provide doctors with a more intricate understanding of patient condition and enhance the confidence that patients have in their healthcare provider. They also help patients feel much more secure as they know that their physician is only a few clicks away. In addition to this, these technologies enable physicians to provide ongoing support to patients who are adjusting to new medications or have been requested to make significant lifestyle changes as part of their treatment. People often delayed or avoided seeking medical consultation in the past because they were unable to take time out for a lengthy trip to the hospital. However, this hesitation to endure a tedious hospital visit had serious long-term repercussions as it allowed ailments to worsen and increased the risk of hospital admissions. Thankfully, we now have bountiful apps that allow patients to gain instantaneous consultation from physicians via video calls. Moreover, these apps have also improved correspondence between doctors and patients when it comes to arranging appointments. Patients can now receive timely reminders about upcoming appointments from their healthcare provider which consequently leads to fewer patient no-shows. Hospitals use marketing channels such as emails, social media, instant messaging, etc to apprise patients about new cures and treatments in an attempt to increase the quality of patient-care and increase public awareness. Previously, they had to send out mass emails and messages which at times would be thought of as irrelevant and spam by patients. This correspondence, however, has improved drastically over the past few years, as hospitals are now able to send out communications to specific patients with specific needs. With social media platforms, blogs and websites, physicians are able to disseminate a huge amount of information about disease prevention and cure and are able to respond to general queries by patients. This ready availability of information and informal access to medical consultation has shifted the focus of patients from curing ailments to avoiding them in the first place. By doing so, doctors are not only able to help save countless lives but are also able to relieve burden off of healthcare providers who strive to provide services to an ever increasing base of clients. Technology has revolutionized doctor-patient dynamics, however, when we look at the rampant pace of technological developments it is safe to assume that this relationship will continue to evolve drastically in the years to come. Audrey Throne is a mother and a professional blogger by choice. She has completed her masters in English literature from university of Birmingham. As a blogger she wrote quite a few posts on health, technology as well as management. Currently, she is associated with heartfeltadopt Team.